Justine the official CraftSanity cat does not want to party with you. She just doesn’t. While her party hat is super cute, Justine fails to see the humor in this “Cats in Hats” book by Sara Thomas her person has been talking and laughing very loudly about for weeks. Justine just wants to roll around in catnip, look at birds and stray cats through the window and nap as much as possible without people laughing loudly around her. Justine does not want to wear a party hat, but she did it anyway for a photo shoot because she got a lot of treats and couldn’t figure out how to untie the hat with her paws. Her person is sorry, not sorry about this. 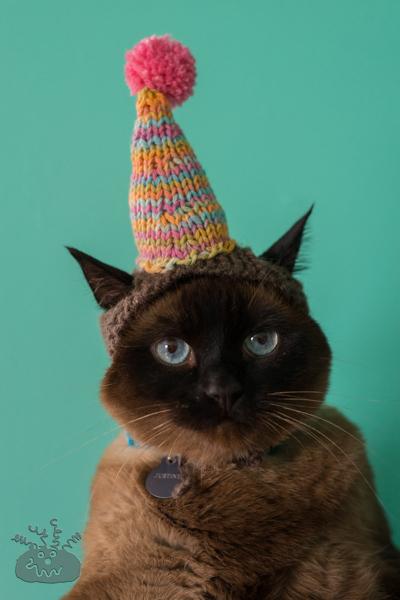 While Justine doesn’t want you to know this, you can find the pattern to knit more party hats for cats below. The good news for Justine and all her feline friends is that this hat is not intended for everyday wear. It’s actually only intended for to be worn on very isolated occasions like during 30-second photo shoots for birthday and holiday cards. If you love your cat, you’ll snap a quick photo after you make her a party hat and then you’ll put it up on the shelf as a “remember that time” memento. It includes a copy of the book, an EXCLUSIVE hat pattern from Sara Thomas, and the yarn necessary to complete the pattern. FIVE runners up will receive a copy of the book. Winners will be contacted by email and must notify us within 48 hours of the notification email with address and acceptance. Please note that winners can be from the US only. Reprinted with permission from Cats in Hats © 2015 Sara Thomas, Running Press, a member of the Perseus Books Group. This striped hat is purrfect for cat celebrations! Base: CraftSanity Tip: When knitting or crocheting this hat, stitch the base with yarn that matches the fur on your cat’s head. This will create the illusion that your cat is wearing the party hat like a boss with no strings attached. Using yarn A and two dpns, cast on 3 sts, leaving a 25 in. (64 cm) tail. Row 13: K3 bind off next 10 sts, k last st.
Row 31: K3, bind off next 10 sts, k last st.
Row 32: K2, cast on 10 sts, k3. Bind off, leaving a 25 in. (64 cm) tail. To create ties, use crochet hook and 25 in. (64 cm) tail, pull a loop through each stitch on bind off edge (3 loops), yo, pull one loop through, work 25ch, pull end through loop tightly and snip extra yarn. Repeat with other 25 in. (64 cm) tail. Using yarn B, cast on 30 sts leaving a 20 in. (50 cm) tail. Divide onto three dpns (10 sts per needle) and join to work in the round. Cut yarn and pull through sts on needle. Pull closed, and weave end into inside of hat. Make a 1 in. (2.5 cm) pom pom using all three yarn colors. Secure to top of hat. Weave ends into the inside of the hat and secure in place. Lightly stuff hat with polyester fiberfill. Do not overfill. Using the cast on tail from the hat, stitch the hat onto the middle section of the base. Stitch into the cast on edge of the hat, until hat is securely in place. Weave end through the underside of base and tie securely.